In February, 2008, Gil Garcetti, former L.A. County District Attorney and internationally acclaimed photographer, spoke to a Los Angeles-based organization, “Salon Forum,” started in 1993 by Barbara Goldberg, founder of Wells Bring Hope. Through words and powerful photographs, Gil conveyed the dire need for safe water in West Africa and the plight of women and girls who walk miles every day to get water. What the women of Salon Forum heard touched their hearts. In a very rational sense, they saw a simple problem with a simple solution: drill a well and lives are changed forever. The very next day, Barbara decided, with their support, to start a fundraising initiative, which took the name, “Water Is Key” after Gil’s book title. The first thing they did was explore NGO’s (non-governmental organizations), to partner with to do the needed work on the ground. They decided on World Vision not only for their experience and expertise in drilling in West Africa but because they do what no other NGO does: continue to work with villages for 15+ years. World Vision also offered the best financial model, enabling donors to get a 5 fold return in terms of services delivered to a village. Another major factor was sustainability, an important consideration in every safe water project. The next decision was where in West Africa to drill among Ghana, Mali, and Niger. When reviewing a list of “the poorest countries in the world,” Niger was at the bottom. The fact that it also needed 12,000 wells, with the government only able to provide 10% of that was another reason why Niger seemed like the country most in need of help. From its inception, Wells Bring Hope, had the highly esteemed Pacific Institute as its fiscal sponsor, making all donations tax deductible. On July 27, 2010, Wells Bring Hope attained its own non-profit status, EIN #27-3123341. 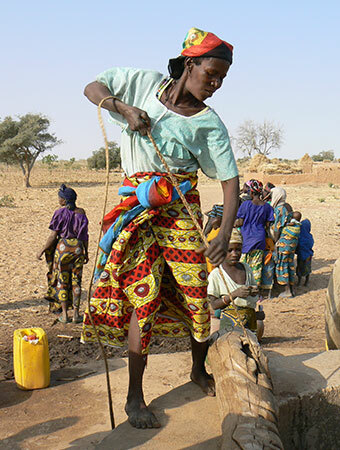 In January 2009, Barbara and five others went to Niger for the first time. It was a life-changing journey. Talking to one woman who lost 11 of her 12 children was something none of the women on this journey will ever forget. To read about what they experienced, go to Journey to Niger.